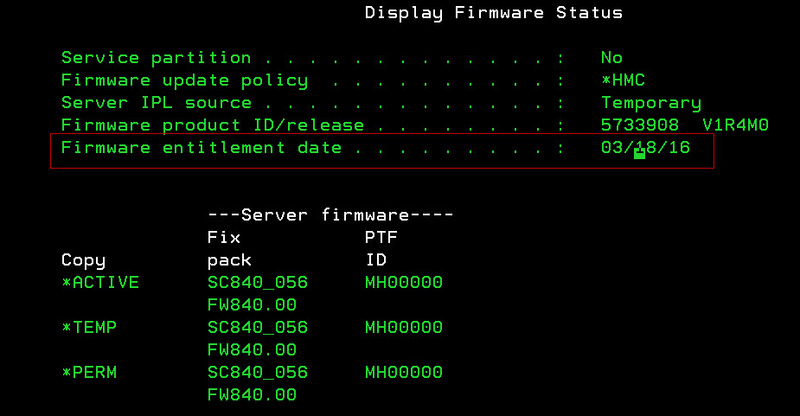 Back in the day, downloading of a server firmware from IBM Fix Central website was limited only to users and serial numbers with valid IBM hardware maintenance contract. With POWER8 servers IBM put such a lock into the servers. Thus, if your hardware maintenance contract expired, you cannot install any newer firmware beyond this date.Doing this IBM eliminates 3rd party companies which offers a HW maintenance independently, and usually cheaper than IBM. Personally I have no idea how it will impact the market, but it certainly will. Does it mean that my server stops if I don’t buy a hardware maintenance in IBM? No! you server will still run, but you cannot install any firmware which was delivered after this date. If your server run for last 3 years without any problems you might think – ‘I don’t need any new firmware’. Well, what about a situation that a firmware become vulnerable just after the maintenance expired? For instance, recently we have seen ssl poodle vulnerability? You are in big troubles. How I can check when a server maintenance expires?